Manhattan District Attorney Cyrus R. Vance, Jr., today announced the indictment of New York City Criminal Court employee CARLOS SANCHEZ, 36, for stealing approximately $163,242 worth of payments for Summons Court fines between January 2015 and February 2017. SANCHEZ is charged in New York State Supreme Court with Grand Larceny in the Second Degree, as well as 35 counts of Criminal Possession of a Forged Instrument in the Second Degree and 10 counts of Falsifying Business Records in the First Degree, for redirecting more than 500 money orders and cashier’s checks intended to pay court-ordered fines to his personal accounts. The New York City Summons Court located at 1 Centre Street handles individual criminal summonses for low-level offenses such as public urination, as well as corporate summonses, typically for fire and building code violations. After a summons case is resolved, individuals and corporations may pay their fines in person, online, or submit a cashier’s check or money order payable to New York City Criminal Court by mail within 60 days. While most summons cases require a court appearance, individuals who receive a summons for Public Consumption of Alcohol or Public Urination may resolve their cases by submitting a guilty plea by mail, in addition to a cashier’s check or money order for $25 or $50, respectively. In his role as Senior Court Office Assistant, SANCHEZ was responsible for opening and sorting the money orders and cashier’s checks intended to pay summons fines, including those submitted as part of an individual’s guilty plea. As alleged, the defendant forged hundreds of these payments to reflect his personal bank or credit card information, while disguising any court or case information – typically by altering the handwritten portions of the payment, such as the payee or memo fields in money orders. SANCHEZ then diverted the payments to his personal bank accounts or used them to pay his credit card bills. In some instances, to conceal his alleged theft, SANCHEZ altered corporate cashier’s checks to pay other corporate fines he had previously stolen. In sum, the defendant is charged with stealing approximately 366 personal money orders and cashier’s checks, as well as approximately 207 corporate money orders and cashier’s checks, totaling $163,242.50. Because of these alleged thefts, court records erroneously showed that hundreds of individuals and corporations had not paid their fines. Bench warrants were issued for at least fifteen individuals, resulting in the arrest of at least five people who had already paid their fines. Similarly, judgments were executed erroneously against at least six companies, and some were contacted by collections agencies for nonpayment. 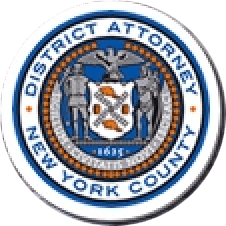 The Manhattan District Attorney’s Office’s Public Corruption Unit is assisting the New York State Unified Court System as it reviews cases potentially affected by the defendant’s actions. Assistant District Attorney Robert Cannata is handling the prosecution of this case under the supervision of Assistant District Attorneys Renée Jarusinsky, Deputy Chief of the Public Corruption Unit, and Luke Rettler, Chief of the Public Corruption Unit, and Executive Assistant District Attorney Michael Sachs, Chief of the Investigation Division. Senior Rackets Investigators Leonid Rashkovsky, Christo Christonikos, and Edward Johnson provided assistance with the investigation, under the supervision of Supervising Rackets Investigator Alexander Farrugia, Assistant Chief Investigator Michael Wigdor, and Chief Investigator Walter Alexander. Investigative Analysts Benjamin Bleiberg, Benjamin Drachman, and Amanda Rutherford also assisted with the investigation. District Attorney Vance thanked the New York State Unified Court System for its assistance with the investigation.